Want a homemade face moisturizer that compares with the best moisturizer at the beauty counter? Want the best for less? Here’s what I found after checking the research for a natural homemade moisturizer -- the best moisturizer that did not have a scary list of ingredients! I’ve paid LOTS in the past, but now I wanted to find a good, low cost homemade moisturizer. You’ve heard about coconut oil health benefits? Well, I had been cooking with coconut oil and using it as a homemade moisturizer. I like the feel, and the effects it has on my skin. But I wanted some reassurance from dermatologists to make sure it is the best facial moisturizer for my skin. So I set out to review the medical research to find out if it’s a good idea to use a homemade moisturizer. Basically, I wanted to know if this homemade face moisturizer was as good as the pricy stuff I have bought in the past. And, I’m sharing my research results here because there’s good news! Not only can you save money, but you won’t have to worry about unwanted ingredients that often are in even the best moisturizer that you pay good money for. Here’s the good news! Coconut oil benefits your face AND your budget! It passes the science test! There’s coconut oil benefits not just for cooking -- but it gets thumbs up as a natural face moisturizer too. How Good’s a Coconut Oil Homemade Face Moisturizer? We know that people in the tropics have used coconut oil as natural homemade moisturizer for centuries, but is it as good as our modern best facial moisturizer? Virgin Coconut Oil works as both a skin moisturizer and as a skin softener, and it also has beneficial antiseptic effects. 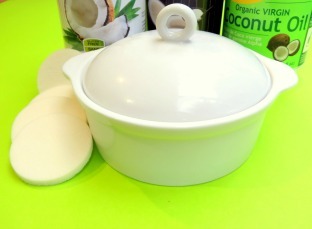 In fact, coconut oil works just as well as mineral oil! It is both safe and effective plus it has added antiseptic qualities. In the cosmetics industry, mineral oil is used in the best facial moisturizers. Mineral oil is also used as the standard of comparison by researchers in dermatology. Because they know the exact qualities of mineral oil, they use it for comparison in testing a facial moisturizer. In a randomized double-blind controlled clinical trial, coconut oil improved “skin hydration” as well as skin “surface lipid levels,” meaning softness or “plumping,” just the same, if not better than mineral oil! This was reported in the medical journal called Dermatitis, 2004 Sep;15(3):109-16, by researchers Agero AL, and Verallo-Rowell VM. Best Skin Moisturizer from Head to Toe? These researchers also tested coconut oil on skin problems like dry, rough, scaly, and itchy skin. They call these types of skin problems, Xerosis, and consider these to be common skin conditions. A coconut oil moisturizer was also tested as therapeutic moisturizer to see if it worked for mild to moderate Xerosis, or itchy, dry, scaly or rough skin. 34 people with these problems were treated for two weeks, and they put either coconut oil or mineral oil on their legs twice a day. When the researchers measured the results, they actually showed slightly more improvement with the coconut oil as with mineral oil. They also did safety tests by using a “patch-test” before the research, which was negative for everyone. They also found that there were no allergic or negative reactions during the two week period. So, you can be assured that you can safely try a coconut oil homemade moisturizer from head to toe! How to Use Coconut Oil as a Homemade Face Moisturizer? I always use the best virgin coconut oil as my natural face moisturizer. I use the same brand for on my toast, for cooking and on my face. Just scoop the coconut oil you use for cooking into a small clean jar to put in your bathroom, and there you have it! How to spread it on your skin? 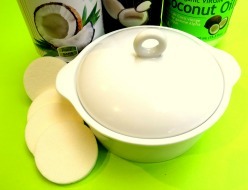 Coconut oil melts when warm, but usually it is hard at room temperature. So if you don’t live in the tropics you might want to put the jar into a bowl of hot water a few minutes to melt it, so that it’s easier to spread. Otherwise, a few lumps can fall on the counter or the floor. If you are using it as a homemade moisturizer for your feet, legs and hands, you can just warm some up in your hands and rub it on. Simple as that! Is coconut oil too greasy? What about acne and acne scars? 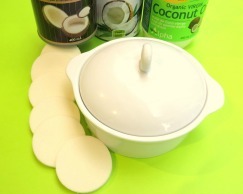 You may want to try it at night first, to find out how well your skin absorbs the coconut oil. There is no reason why you cannot use it as a natural face moisturizer under your makeup during the day. But it may take a bit of patience to experiment how much to use, if you also use foundation. If you have acne, rough, dry or itchy skin, you can be reassured that it has healing and antiseptic properties. For extra healing qualities, you can add a few drops of pure lavender oil into the jar that you use at night. Lavender oil is very effective for healing burns and is also used for acne and acne scars. With the antiseptic qualities of a coconut oil moisturizer, you may well have an effective homemade acne treatment. Hopefully you have been re-assured to try a homemade face moisturizer made from virgin coconut oil. Add lavender essential oil for mood and lowering blood pressure! Really? Especially at night, you can add essential oils like lavender for extra healing, but during the day you won’t want a strong scent added to your homemade moisturizer. No need to spend a fortune at the cosmetics counter! Your homemade moisturizer will stand up to the ingredients used by the cosmetics industry. You can be assured of the benefits of coconut oil as the best skin moisturizer for your whole body! And you’ll be doing without the cost and the long list of unwanted ingredients that’s in the best facial moisturizer on the market! Hope you found what we shared here to be helpful. If you “like” this page, please share our “best kept secrets” from nature and this homemade moisturizer with your friends! We’d love to hear from them too! Ask them: What's the best Facial Moisturizer? Want a Natural Face Moisturizer? Here's an EASY Homemade Face Moisturizer Passes Best Moisturizer Standard Test! J Med Assoc Thai. 2012 Apr;95(4):598-606. The effects of lavender oil inhalation on emotional states.